In small bowl, mix butter, salt, garlic powder, smoked paprika and pepper. Brush both sides of chicken breasts with butter mixture. Place chicken in air fryer basket, standing against sides of basket if necessary. Set to 350°F; cook 15 minutes. Turn chicken; cook 5 to 8 minutes longer or until juice of chicken is clear when center of thickest part is cut (at least 165°F). Standing chicken against the sides of the air fryer basket prevents the chicken pieces from touching, which helps the chicken cook evenly. 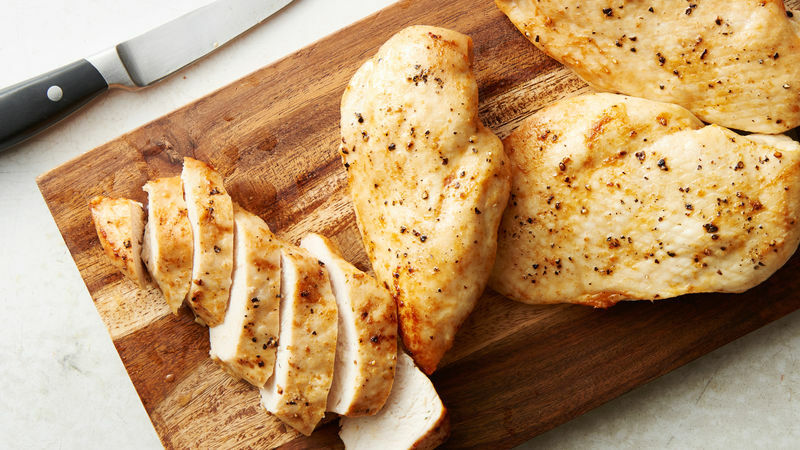 These simple chicken breasts are great for an easy weeknight dinner, but they are an easy, versatile way to prep chicken for other uses. Make it on the weekend and use in chicken salad, bowls or sandwiches throughout the week.